I wanted to review this bike ever since I had a tease ride about a year back and wanted to take a closer look. As I had surgery on my knee done, the testride had to wait for quite some months. 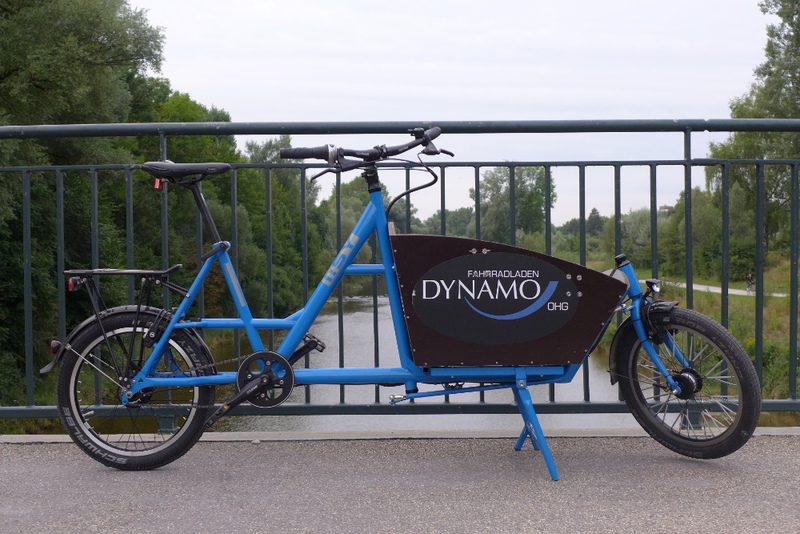 Finally, when I was ready to ride again, the Dynamo, a friendly local shop let my take the I:SY for a spin. 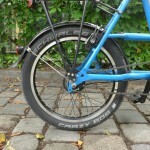 Standing on it’s 20″ wheels the I:SY Car:go looks like the pony among the workhorses. It appears a little odd but is sympathic, as if you could just clutch it under your arm and take it anywhere. Well there is your first mistake. It IS sympathic. But you won’t carry it anywhere. This solid piece of german engineering weighs over 35kg. 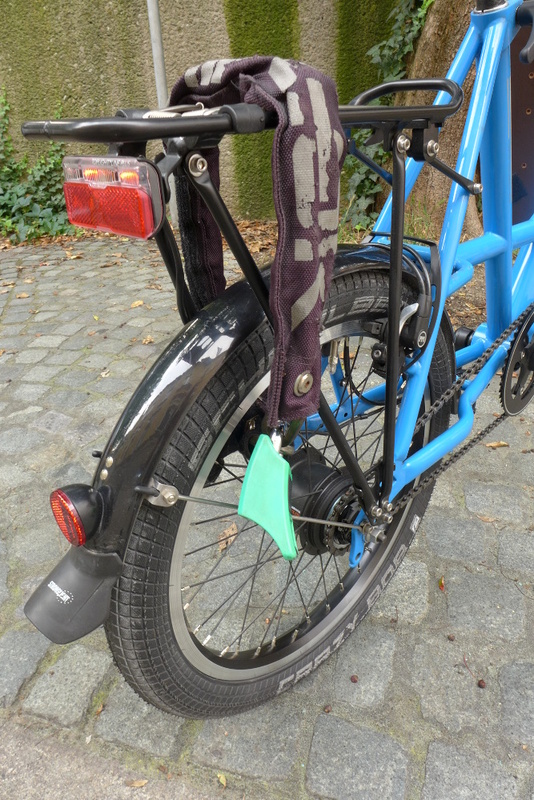 However it is still a perfect daily rider, as it is maneuverable and comfy. 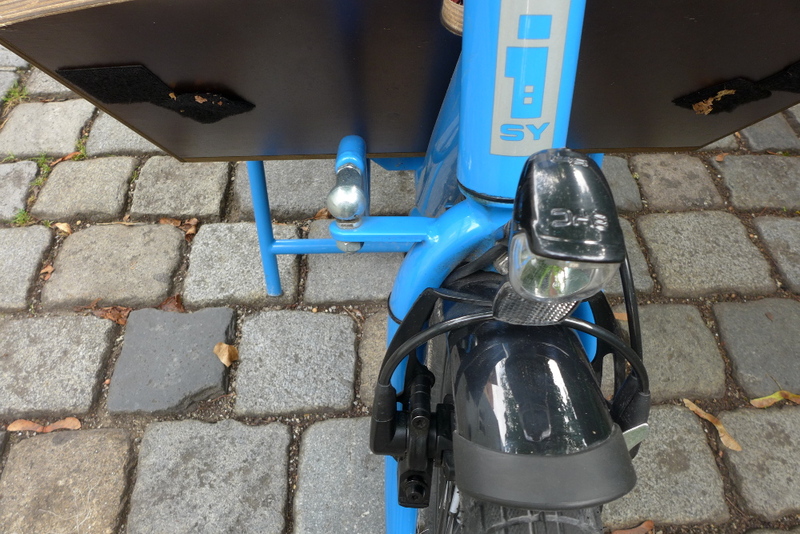 The handling is just as easy as the brand’s claim promises: Even a friend of mine, who had his first time riding a cargo bike, had no trouble to carry a grown person with 73kg in the box of the I:SY. The box, by the way, is an additional item, which comes with a bench, but without belts. The dimensions are 48cm x 50,5cm (length x width at the bottom) and leave enough room for groceries, cats or dogs like Ludwig, the workshop dog at the Dynamo. 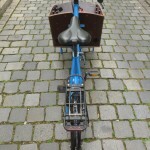 The practical box has a weight of 8kg and costs about 240€ extra. 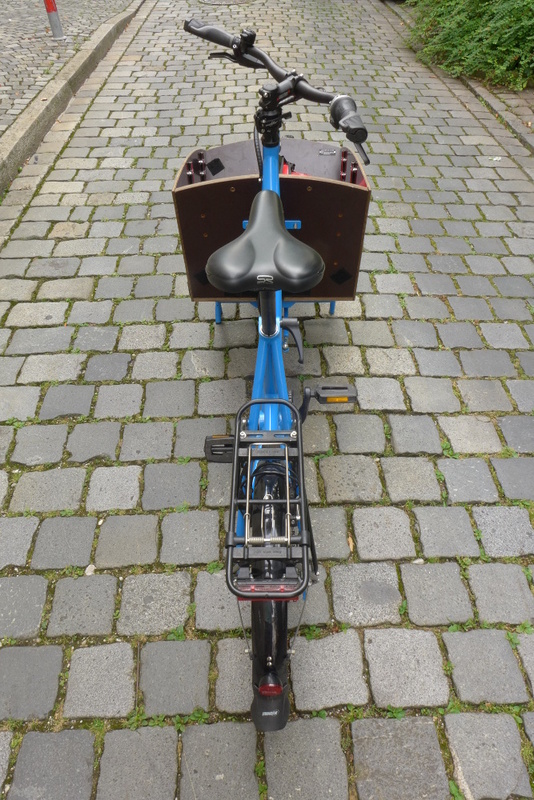 With a wheelbase of 179cm and a steering angle of +/-50° the I:SY cargo bike doesn’t need much room to corner. Its incredible 280cm turning circle makes it perfect for the inner city with small alleys and pedestrians. Both of which Augsburg provides, next to cobble stone. Lots of cobble stone. 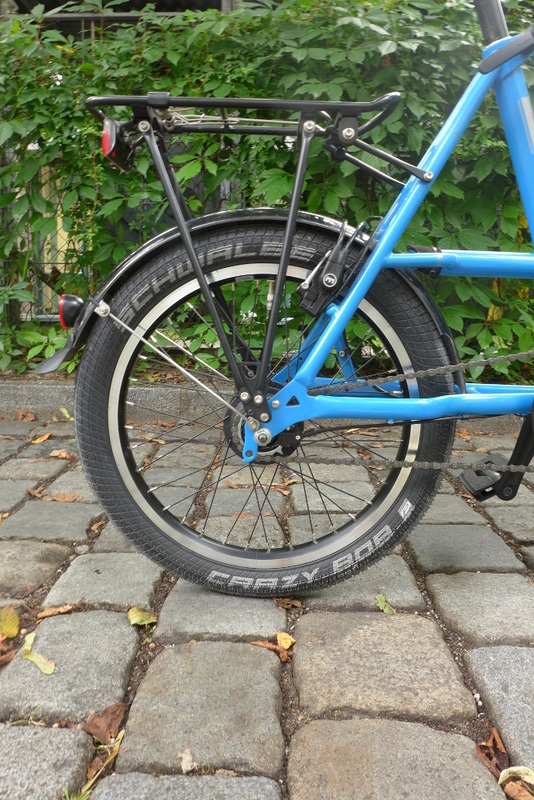 With its wide Schwalbe Crazy Bob tires, the Car:go took care of that too. 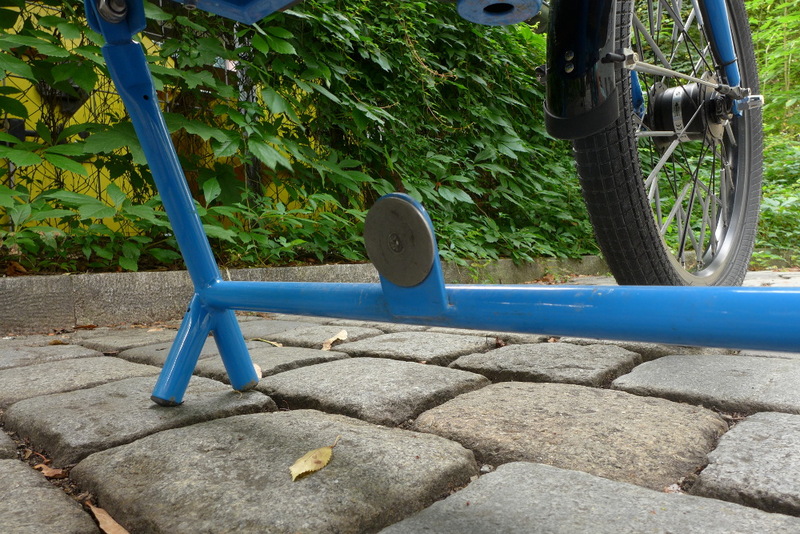 It rides nice and smooth over any obstacles and it makes you forget its rather high weight. 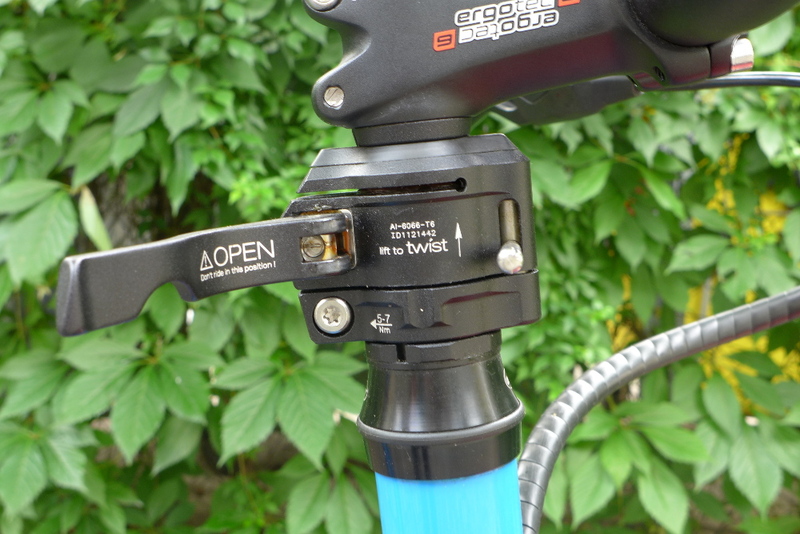 The 8-speed Nexus in the tested bike did its job well and even short climbs are easily managed. 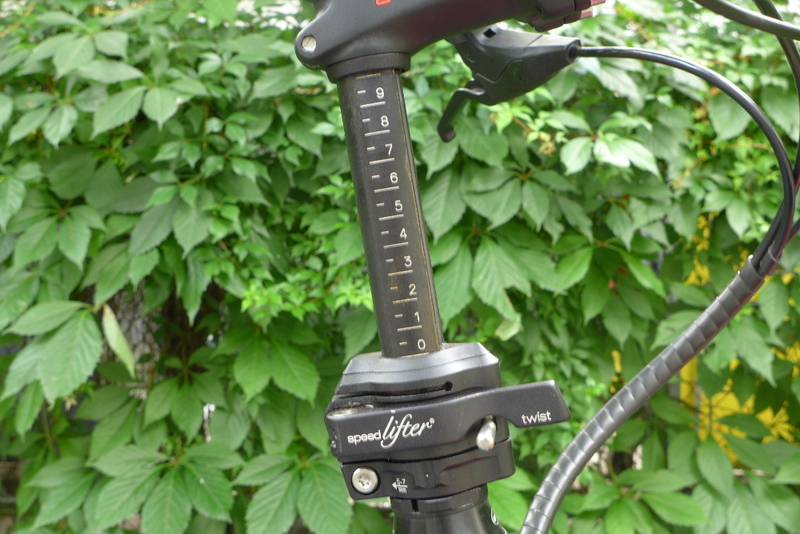 A nice idea is the magnet holding the kickstand, making it easy to get it on and off the stand. A little drawback is, that it seems to release slightly too easy: Quite some times the kickstand dropped while rinding over rough terrain. Also it could be a pinch further in the back, in order to get the bike off the stand while having a lot of weight in the box. Yet this is not a show-stopper. 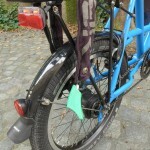 Talking about parking: Take a long chain-lock with you! 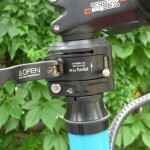 As the Car:go is rolling on 20″, it is hardly possible to pull the lock through the spokes. 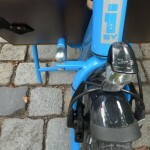 You will consider locking it to poles and other street interior. 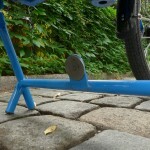 More clever features are the stem, that adjusts to your body size within seconds and closed ball joints on the steering which should be durable enough for years of riding without play. a solid little workhorse you want to clutch under your arm. 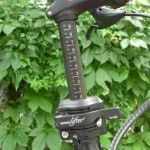 has an adjustable stem adjusts perfectly to your body size. take a long chain lock. you will need it! 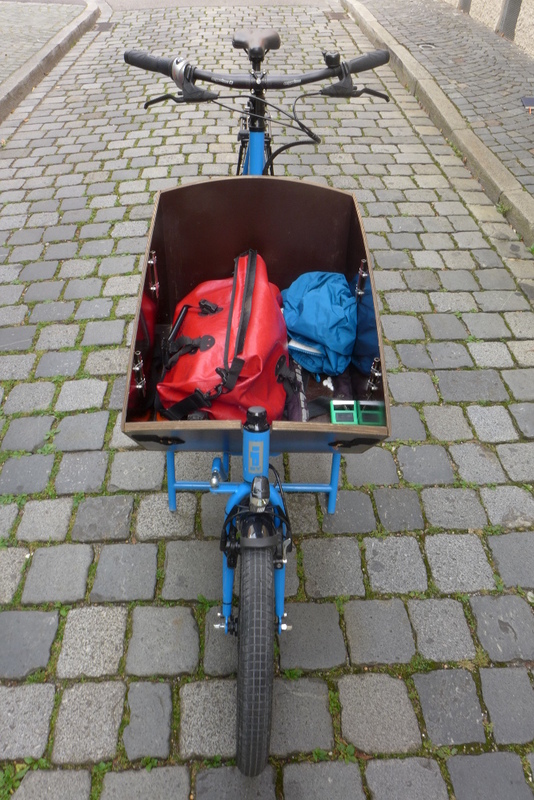 Summed up this little pony can totally be taken for a full-size cargo bike workhorse. 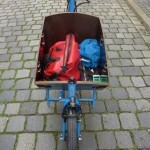 the I:SY Car:go is indeed a tough little freight bike: not very lightweight, but built to last. 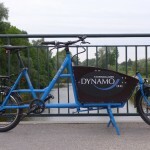 If your not delivering cargo in a hurry, this freight bike will be a lasting companion on your daily errands. IS:Y also takes care of your personal taste, ability and situation: the (2016) catalogue offers the choice between 8 different colors and eight setups which also include four electrically assisted models. The assisted variant then comes with a GO SwissDrive engine, a solid hub-engine. Starting 2017 the electric Car:go will be delivered with the GO EVO Display.